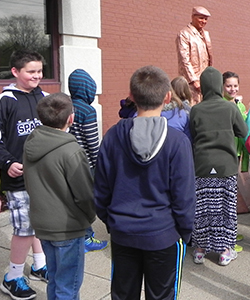 “Let’s try to make him laugh” giggled a crowd of Sparta’s Appleview Elementary fifth-graders as they huddled around the “Live Statue,” who today was posing as Johnathan Nash, who helped get Sparta Township going in 1846. It didn’t work. Robert Shangle has been painting himself gold and posing as a statue long enough, that even students making silly faces won’t cause him to bat an eyelash – unless on purpose. 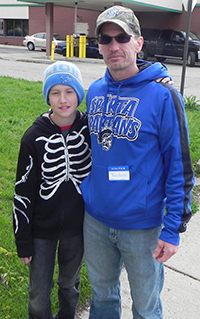 Shangle was one of about 30 Sparta community members stationed throughout the town to participate in an annual historical walking tour organized by Appleview teacher Larry Carter. Each station features a historical building or monument and someone to explain its history. Classic cars were driven up and down the streets tooting their horn to add to the historical vibe of this close-to-home field trip. 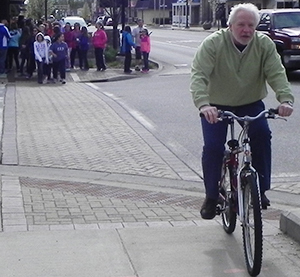 The result: 160 fifth-grade students got part of a day to walk around Sparta, many accompanied by parents or family, learning about their community’s past from the people who have lived through it. Each team of students and chaperones had a binder with old and new photos of Sparta’s landmarks to be able to compare the two. Most of the stops on the tour were presented by senior citizens who had witnessed the changes first hand. One of the photos featured a baby in a carriage in front of the historical Bradford House. The baby was Sparta High School student Caelin Murdock, who was proud to share that she was an 8th generation Sparta resident during her presentation of the house. As a fifth grade teacher and Sparta’s Historical Commission President, Carter is passionate about local history. The idea for the historical walk came to him while writing his master’s thesis: “Using Local History to Garner Interest in State and National History.” He has since incorporated this idea into his individual development plan, part of every Sparta teacher’s work. Carter explained that local history isn’t included in required curriculum standards, but it is important and can help spark a deeper interest in history for students. He also ties this lesson about local history with his Memorial Day lesson, where he honors Sparta veterans. “This day could not happen without massive amounts of help,” said Carter, acknowledging his friends and peers who offer their time to be history teachers for the day. Carter is humble about his own efforts and the impact he has on the students. “He’s so amazing,” said Utter, who explained how Carter works tirelessly to prepare the event every year. This is the walk’s 19th year.